Pecan Pie can be a tricky dessert to get right! Get my fool proof recipe below. When my sister and I moved away from home, we were keen to start inviting the family over for a big feast. For years my Dad had slaved away in the kitchen cooking every Sunday lunch as well as a big roast on special occassions. I quickly decided I’d host a dinner around the same time as American thanksgiving. We have a few American friends and although its not a holiday we have any particular connection to I’ve really come to love the food and the togetherness a thanksgiving meal brings. The first year I hosted Thanksgiving I cooked a pumpkin pie for pudding – I wasn’t sure if my family would go for the American classic so made a cherry pie as a back-up. 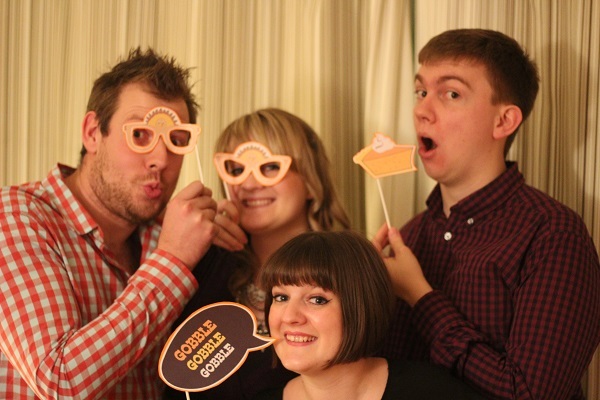 Luckily for me the pumpkin pie went down a treat! 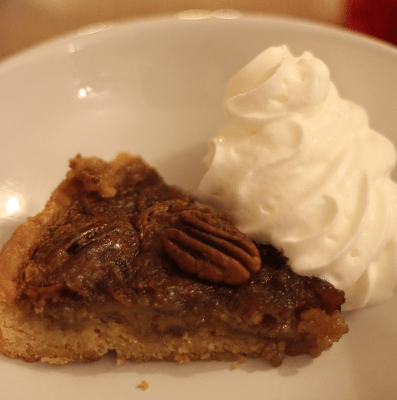 Because the pumpkin pie had been the star of the meal, I was inspired to try another American classic – the pecan pie. I’ve now made this recipe on numerous times and it is a firm family favourite. The key to the perfect Pecan Pie! There are just a few simple ingredients that you will need for a pecan pie and because its such a simple recipe, it is best to ensure you have good quality ingredients. Lots of Pecan Pie recipes (particularly the American ones) will call for Corn Syrup but for me the best pecan pie is made with good quality maple syrup. Corn syrup is too similar to British treacle and so didn’t really pack the punch I was after. Golden syrup is just far too sweet. Maple syrup on the other hand brings a brilliant combinations of American sweetness but also a heady depth of flavour that the other sugar syrups just don’t have. I’m genuinely starting to believe that booze makes everything better… no I’m not an alcoholic! It just seems to me that quite recently a lot of my puddings have been given that extra lift with a splash of the good stuff. Bourbon isn’t a term used that often in the UK so for those of you who don’t know bourbon is a type of American whiskey made from corn. Not to be confused with the whisky we drink in the UK which predominantly comes from Scotland and is made from malted barley, wheat and rye. Because bourbon isn’t all that common over here I used Jack Daniels’ Tennessee Whiskey. I’d recommend any other good quality bourbon or a single malt Scotch (keep it sweet and not too peaty). I can’t stress enough how important it is to toast your pecans. I am all for taking short cuts and sometimes I just can’t be bothered to toast my nuts but when you want to make the perfect pecan pie it is essential. It brings out the natural oils and, I think, gives the pie a much more rounded flavour. Their is a bit of a debate over whether or not you should add chopped pecans or halves to the pie filling. Personally I like a bit of both. That way you get plenty of nuts running through the filling as well as a bit of bit. For the perfect pecan pie decorating the top with glazed pecans is a must. When I was researching Pecan Pie recipes I was amazed at how many of the American recipes called for a shop bought pie crust. It wasn’t clear to me whether this should be shortcrust (sweet or plain) or perhaps even puff pastry. After a little more digging it seemed shortcrust was the only possible answer! I like to add a little sugar to my shortcrust for a sweeter pastry and sweeter all-round pie. It would seem many pecan pie cooks are also undecided about whether or not the piecrust should be blind baked first. For me this is a non-brainer. You should definitely blind bake the pastry or your risk a soggy bottom and no one wants that! It's easier than you think cooking the perfect pecan pie for thanksgiving! To make the pastry, sieve the flour and icing sugar into a large bowl. Cut the butter into small cubes and rub into the flour and icing sugar mix until it forms a mixture similar to the texture of breadcrumbs. Add the egg and milk to the breadcrumbs and bring the mix together into a ball of dough. Once the ball of tough has come together, place in a smaller bowl, cover with clingfilm and leave in the fridge to rest for 30 minutes. After letter the ball of dough rest, roll out on a lightly floured surface until roughly half a centimetre thick. Line an 8 inch pie tin with the pastry and fill with baking beads. Bake in the middle of the oven at 200C (or gas mark 6) for roughly 10 mins. Take out the baking beads and cook uncovered for a further 10 mins until golden brown. Place the pie shell to one side while you make the filling. Next, place the butter, maple syrup, vanilla and bourbon into a heavy based saucepan on a low heat. Stir gently allowing the butter and sugar to melt until a syrup is formed. Try to avoid stirring too often at this stage. Take the pan off of the heat and leave to cool for at least 10 minutes. Add the beaten eggs to the cooled syrup until fully combined. Roughly chop some of the toasted nuts and spread over the bottom of the pie crust with the remaining toasted pecan halves. Pour over the syrup. You may find it easier to do this when the pie is already on the oven shelf to avoid spilling it on the way to the oven. Cook the pie in the middle of the oven for 40-50 minutes. The pie should be golden brown and caramelised. You will know that the pie is done when it is still slightly wobbly and soft. 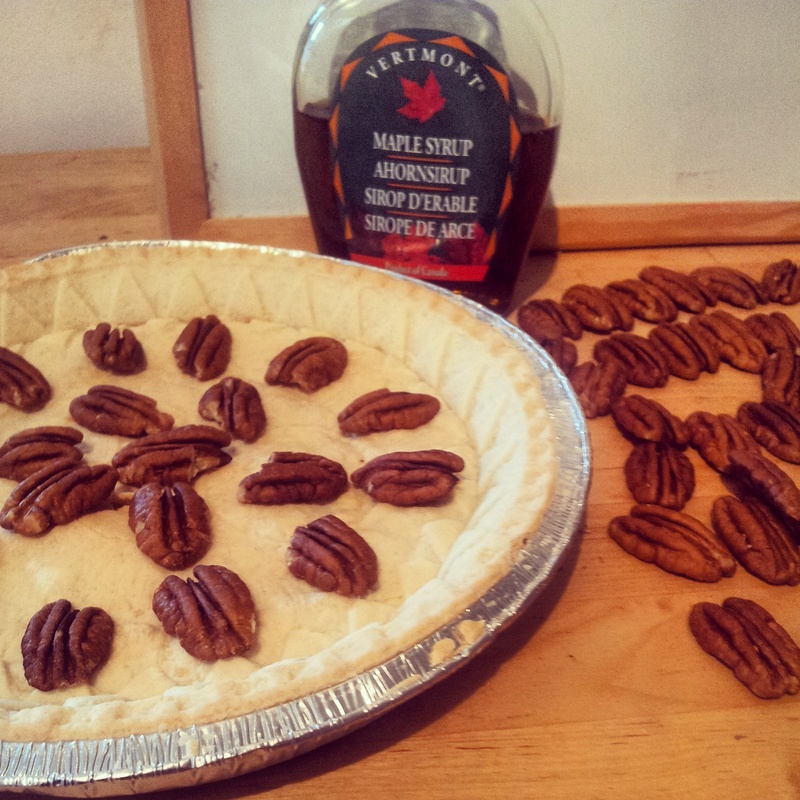 Place the glazed pecan halves on top of the pie in a spiral pattern before placing on a wire wrack to cool. When it comes to cooking the perfect pecan pie I have one top tip which if you take just one thing away with you let it be this – don’t overcook your pie! Although I knew that the filling to this pie was essentially a custard, I wasn’t entirely sure what the texture of the pie filling was meant to be. When the filling is golden and beginning to caramelise but is still slightly wobbly its the perfect time to take it out of the oven. Take my word on this and I promise the pie won’t disappoint. This recipe now firmly sits with pride of place as one of my favourite American Desserts. To all of you celebrating Thanksgiving this Thursday I hope you have a fantastic day! Happy Thanksgiving to you too! I love pecan pie. Thanks for sharing this recipe! Oh wow that looks amazing. Something I’ve never tried!! Great tips! Thanks Jacqui I wish I’d had more time to take some proper photos rather than just instagram snaps. Thanks Kerry. It was good fun trying all the different combos and seeing what worked best 🙂 so much pie!!!! !